The odds of this dish making it to the blog were pretty slim. I was drawn to it initially from one of those new step by step videos (something I need to think about doing …). The reviews were not wonderful, and even friends of friends deemed it a “bland waste”. Curry anything is not in my top five, another strike. For some reason though, the blend of coconut, earthy curry and unique heat had been calling my name for weeks. Always in search of something new and easy, I decided to set things up for success and see what several tweaks would do! This was also my first attempt with boneless skinless chicken thighs. Score! I loved them. There was a scant bit of fat on some which I left for flavor,but not too much to have a measurable depth when cooked. Shredding was a breeze with no wiggly wads of fat floating, no bones to work around and no broken bits of bone to strain. The best part? The chicken was tender and juicy. Certainly a surprise keeper all the way around. The original recipe had few vegetables and used jalapenos. I subbed poblanos for the jalapenos for a milder heat. (another beauty of this recipe is it’s versatility). I cut back on the coconut milk and added vegetable broth, and tossed in some curry friendly veggies. I was home so I scattered the addition of the vegetables, but it can just as easily all be put in the crock together. Combine coconut milk, broth, curry powder, curry paste and basil in your crock. Stir well and put on high while you brown chicken. Set the timer for an hour. Season chicken with salt and basil. Lightly brown, about 5 minutes on each side. Put the chicken and the juices from the pan into the coconut milk in the crock. Add in half the onions and garlic. Cook for an hour. Then add in the rest of the vegetables. Keep the lid shut. Set the timer for 3 hours. Shred the chicken with two forks. Add in the minced turmeric and ginger. You can also at this point add a slurry of 2 Tablespoons corn starch and 3 Tablespoons broth to thicken your curry. I chose not to. I had so much chicken once shredded it was more than thick enough. Cover and cook another 15 minutes after shredding. ………a perfect start to fall dinners. Pre-heat your oven to 400*. Make your dipping sauce and season to taste. As it sits, it will get spicier. Beat your eggs very well, and allow all the foam to die down. This helps keep the crumbs on. On a piece of wax paper, combine your panko and your seasoning.Really you can any seasoning “you” like. I didn’t have a Cajun seasoning so I used the Tabasco one you see above. I also cut out any additional salt. You don’t need it. Peel your onion. Cut off about 1/4 off TOP of the onion. Do not cut the root end as this is what holds your “blossom” together. Starting about 1/4 inch from the root, cut down. Continue every 1/4 inch or so. Do not cut close to the root, as your onion will immediately fall apart.. With a very large onion you should make about 14-16 cuts. You can see how large my onion is compared to the egg in the picture. Open the petals gently….Pretty, isn’t it? The egg bath got a little tricky. First of all I couldn’t find my pastry brush. That would have made things easier. I’m still not sure mine was the better way, as I did get a good amout of coverage. Using my hands I turned the onion around several times in a bowl. Then I poured the rest of the egg over the onion. Ready to bread this bad boy, I placed him on a parchment covered baking sheet. I sprinkled the breading all over, and up the sides. Gently open the petals so that you get the crumb mixture all over the inside. Press down so it holds. Remember ..this is a lower carb and healthier version of that million calorie heart stopping one in the restaurants. It’s not going to look exactly the same, but trust me the taste is every bit as satisfying. Into the oven for 30 minutes. If you want the onion softer, add 5-7 minutes. I prefer them not as limp as the restaurant version. You many have to use a small spoon to add crumbs to some of the pieces as you pull them ..Again, this is about saving calories, tasting onion and not a greasy glob of breading, and not having the mess of a vat of oil..
As delicious as it is pretty. Enjoy.I surely did! Beat eggs, br. sugar or honey, cream and vanilla, until sugar is completely dissolved. Soak your bread in it, turning carefully until every last drop is absorbed into bread. Heat just enough unsalted butter to coat the bottom of your pan. Place bread in pan. Please make sure your toast is cooked all the way through. At least 5 minutes per side, on low, to medium heat at the end to brown. While your toast is cooking, make the filling by blending the yogurt and peanut butter. Remove bread from pan. Spread pb mix, and top with banana slices on one side. Garnish with powdered sugar and pepitas, and a heart shaped banana slice. This is a really easy recipe. I make a version of it every year. For some reason this year it came out very well. The directions on the bag have a ridiculous amount of sugar. So can the can of that wiggly stuff and take less than thirty minutes to make it yourself. 1 bag fresh cranberries – 12 oz. Pour cranberries in a sauce pan. Add mandarin oranges and the juice. Zest the orange first, then juice it and add to the cranberries. Grate the ginger knob and add it and the cinnamon. Stir to mix. Bring to a boil. Let simmer about twenty minutes .When all the cranberries have popped, turn off the heat and let cool. Every time I make something new I tend to declare it “the best I have ever made”. Longing for cool days, and always in the mood for soup I put up a crock full the other night. When I tasted it the next day, I said those very words.Not thinking it would be this spectacular (it really is) I didn’t take step by step pictures. It’s quick and easy though, and the outcome is so worth it. Silky, not too thick, and perfectly seasoned. It’s easily adapted to your own tastes. You’ll find a few alternative suggestions at the end of the recipe. Don’t shy away from using a can of coconut milk. There was no coconut taste to this, but it yielded a creamy texture without the heaviness of cream. Pierce the skin of the squash in several spots. Microwave in a damp paper towel for 12 minutes. Cut in half, and let cool a bit so you can handle them. Peel and cut potatoes in small cubes.Put in crock. Add broth and water and turn on high. Set timer for 5 hours. Cut squash in half. With a sharp knife cut a criss cross pattern – cutting almost to skin. then take a spoon and scoop the cuts out. You should have a bunch of cubes. Add to crock, then do the same with the other half of squash. Add all your seasonings, and HALF of salt only. Cover. Go to bed. Next morning add the can of coconut milk, or whatever milk you are using. Cook for one more hour on low. Using an immersion or regular blender, puree the soup. Taske for need of salt. Add just a bit at a time. I served this with some grated parmesan cheese, a bit more red pepper flakes and a few Pepitas (toasted shelled pumpkin seeds) to garnish. This is a VERY adaptable recipe.It would be good just made with with 2 T. of dried dill in place of the other seasonings. Add some fresh dill at the end, and for garnish.Sage would be nice too, as well as thyme. Any seasoning that pairs with squash would be wonderful. Go for your favorites. 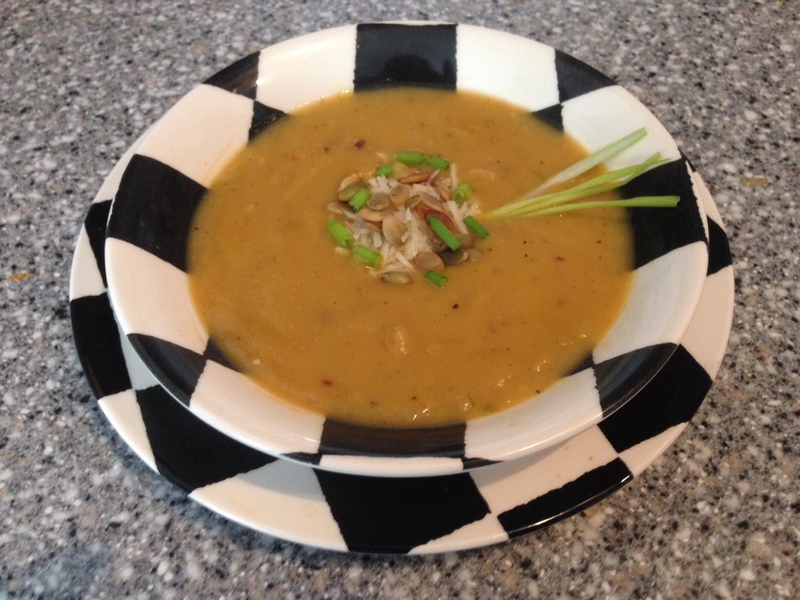 You can also omit the squash and make an all potato soup.Try some Yukon Golds for variety. Or switch out a few white potatoes, and add a few peeled cubed sweet potatoes and a carrot or two. 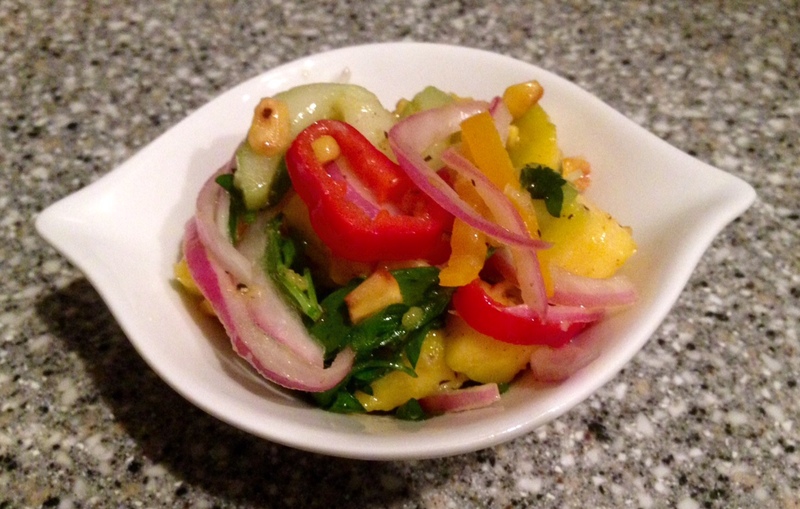 Tangy and not too sweet, the base for this dressing is rice wine vinegar. Rice wine is tart but also has a bit of sweetness to it, which nicely compliments the addition of citrus. Many citrus based dressings call for additional sugar.I personally don’t think it’s necessary, least of all two entire tablespoons of it. 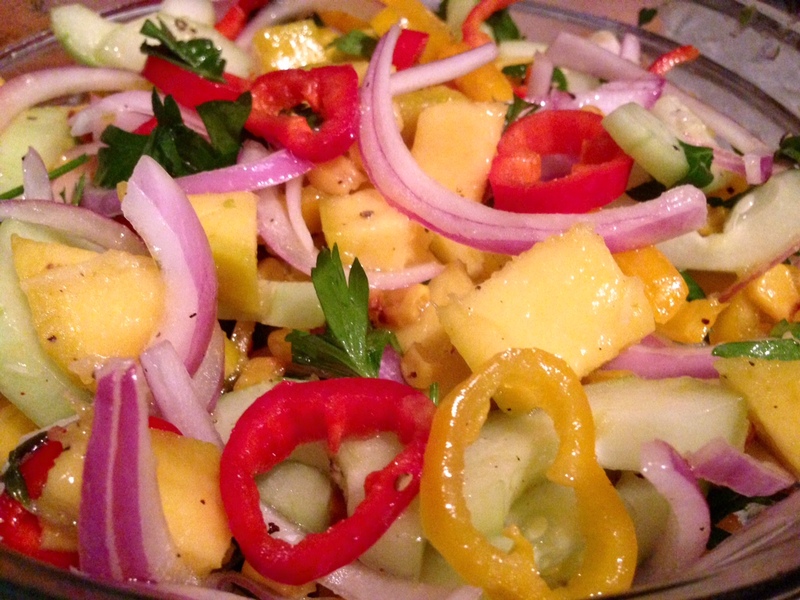 This goes well on any type of salad, fruit or veggie. Whisk all ingredients together and let the flavors combine at least two hours before serving. When you just eat a mango it’s a get messy, sweet juice dripping down your chin experience that you might not want to have in front of a crowd, kind of fruit. For that reason it’s best cut up in neat pieces. Mango is a friendly fruit. It plays well with fish, chicken, other fruits and vegetables. I found a perfectly ripe and ready to use one while hurricane supply shopping yesterday. 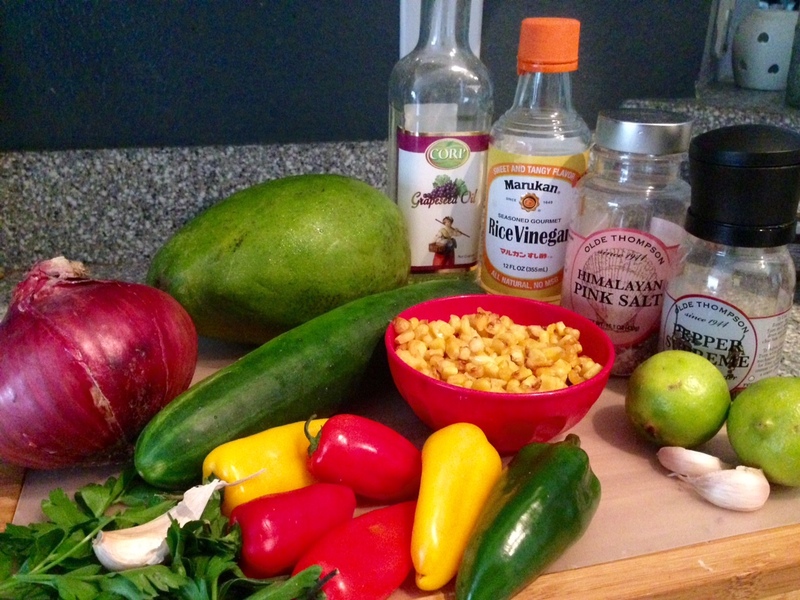 I wasn’t much in the mood for a salsa, so looked for things that would make it more salad-y. However, if you chop the ingredients finer and squeeze just the lime over it instead of making a dressing, , you would have a salsa that would perch nicely on tortilla chips. Refreshing and tangy the dressing is rice wine vinegar based. Rice wine is one of my favorites on fruits. Many citrus based dressings have sugar in them, but I omitted it. Between the sweet tone of the rice wine and the fruit itself, there is just no need. 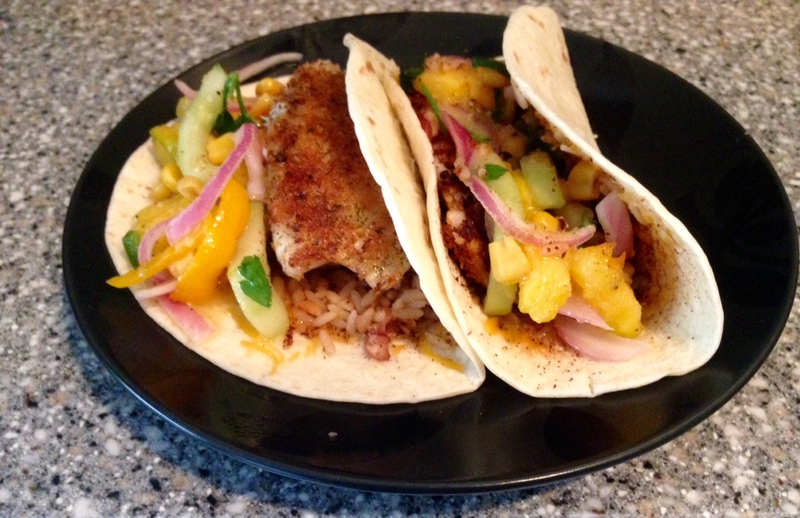 This was a side for us for dinner, but as you can see the next day we piled it in a soft tortilla for fish tacos. 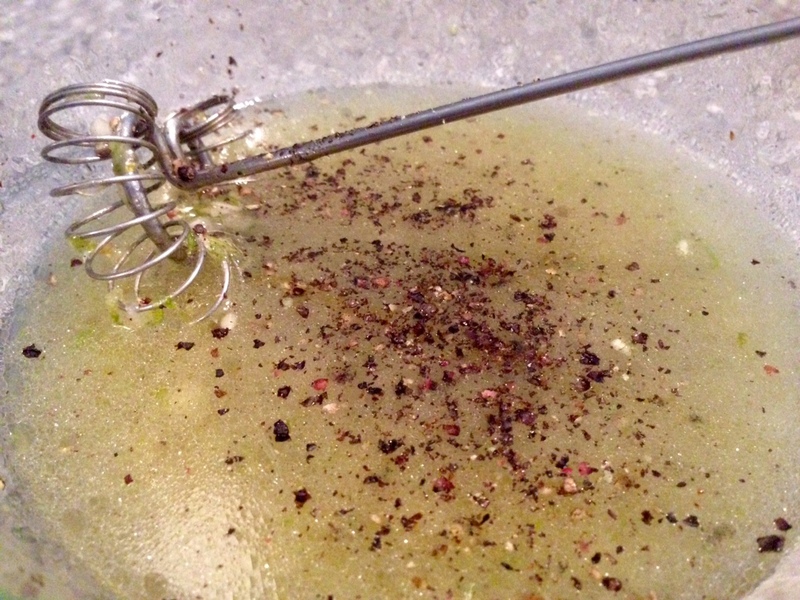 Whisk all your dressing ingredients together. Set aside while you prep your other ingredients. This dressing was so good, even before it sat for a bit. I recommend making extra. 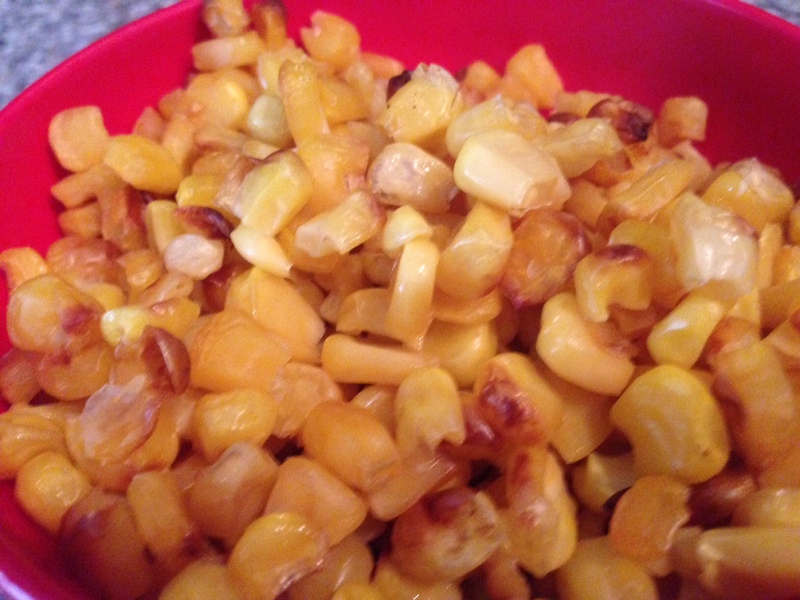 Drain the corn well and spread it on a baking sheet. Add just a tiny bit of oil and toss to coat. Broil for about ten minutes until it chars just a bit. Begin your salad assembly while the corn is broiling. 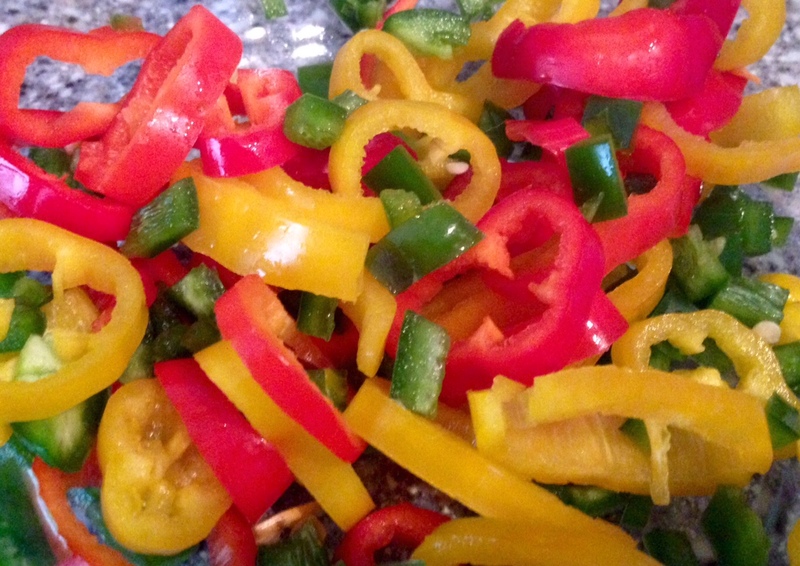 Add your peppers and jalapeno to a large bowl. 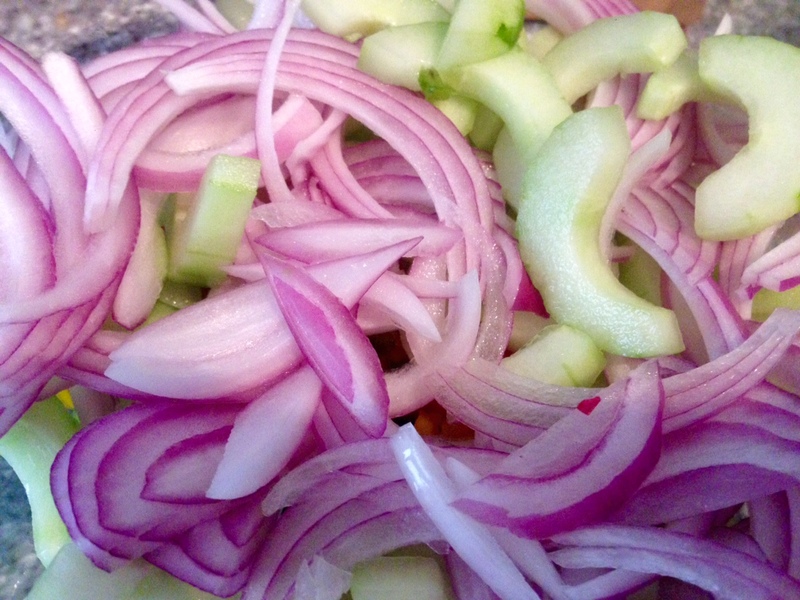 Next, your cucumber semi circles and thin slices of onion. 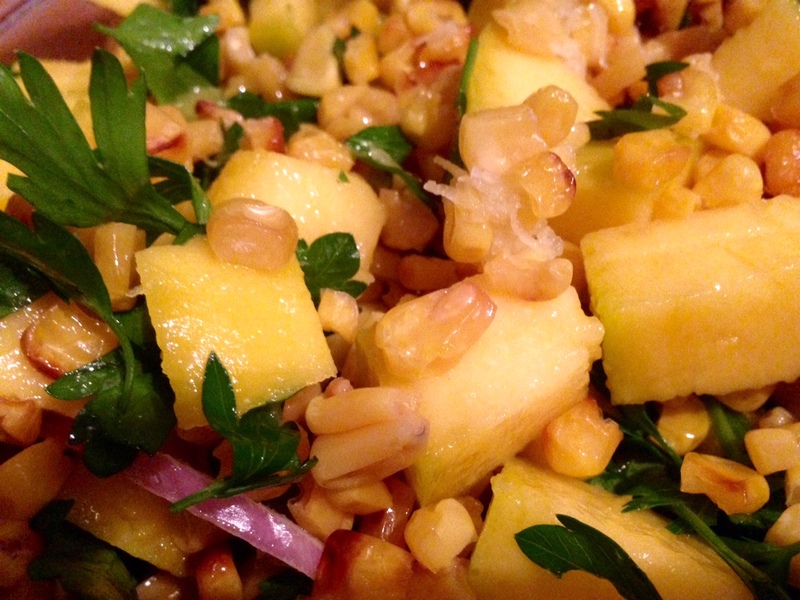 Top off with your mango cubes, the charred corn and the parsley. Mix them up. Isn’t this one of the prettiest salads ever? 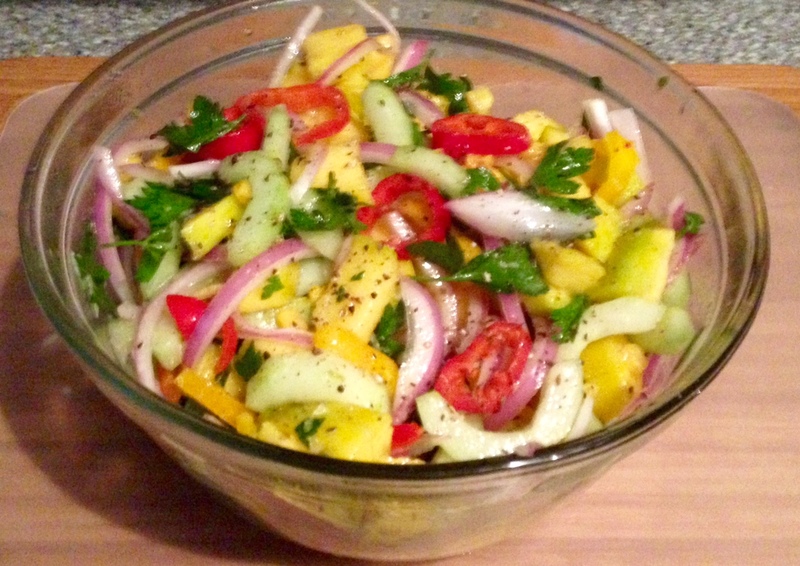 Wake up those flavors with a rainfall of that luscious dressing. Use it all. Let sit for at least two hours,if you can stand to wait. It’s worth it. Twist some black pepper over top, just because. or pile it inside a warm spicy fish taco.